...with everything you'd expect in a figgy pudding, well, except for the flour and eggs. Brown sugar, figs, oranges, spices - they all add up to an amazing fragrance you'll love. And the soap? Made with all natural base oils, essential oils, and quality fragrance oils. 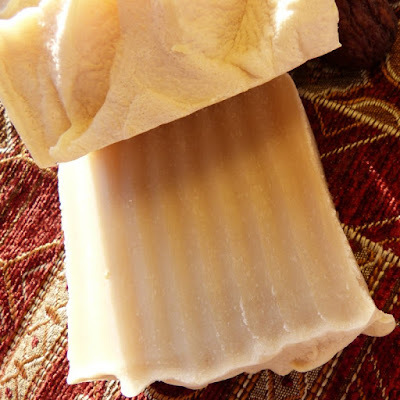 Altogether, it makes a beautiful and fragrant bar of soap for your shower or bath. Each beautiful bar of 'Figgy Pudding' comes wrapped in its own distinctive label with a list of ingredients on the back, and is enclosed in a clear cello bag, ready to give as a gift. Of course, the cello bag is resealable - so if you're careful, you can smell that amazing fragrance before you give it away! No one will ever know. Great for stocking stuffers or 'Thinking of You.' This is a gift they will remember, for these natural, handcrafted bars last a long time. Stock up now. You-know-what is just around the corner! You'll love this! Don't forget to get extras for your guest bath - and for gifts! Note: This is the same soap as 'Fig & Brown Sugar' but will come with a 'Figgy Pudding' label.